In the following guide, we aim to answer that question by offering an in-depth review of the best camping coolers currently on the market and a detailed analysis of what goes into the making of the ideal cooler for every type of adventure. Let’s start off with our top picks of the best outdoor coolers per category for 2019. How To Choose A Camping Cooler? If you’re serious about keeping your refreshments cool, you might not have to look any further than the YETI Tundra 35. This beast of a cooler is every bit as serious as you are, packing 3 inches of tough PermaFrost Insulation, an incredibly durable, bear-proof construction, solid lid latches to prevent accidental spills, easy drainage, and pressure-injected, commercial-grade polyurethane walls. This cooler wins our vote on account of many highly lovable features, but the most significant of these are its take-anywhere ruggedness and durability, and its ability to live up to the 3-day cooling capacity claim made by the manufacturers (not something that can be said of every cooler, we assure you!). 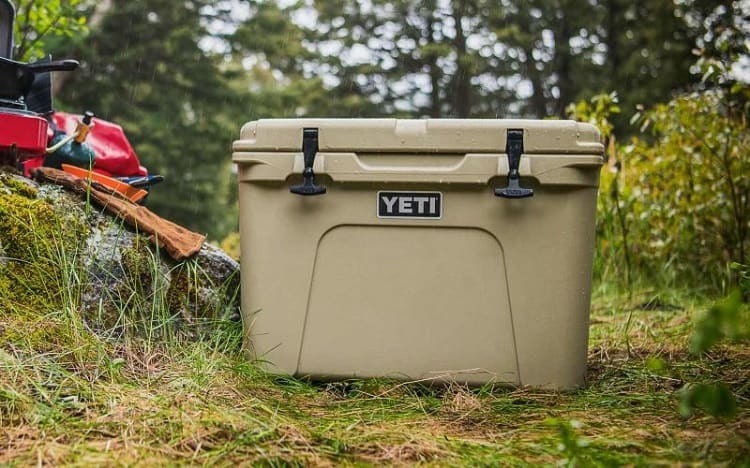 While other coolers will wilt after a few hours in the sun, a bit rough and tumble, or simply deteriorate performance-wise over time, the YETI Tundra 35 is made to last and offers the same kind of cooling performance it offers on day one many years down the line. It’s hard to find any fault with this cooler barring its price and—for some—limited capacity. Mitigating the first of these potential failings, however, is the fact that for your added buck you get a cooler that performs better than any we’ve ever known and will be with you for the long run, no matter how much abuse you subject it to on your backcountry outings. This cooler doesn’t come cheap, granted, and might weigh a little more than you’d like when empty, but in terms of performance there are very few competitor coolers that come even close to matching it. Does it get any more convenient than plugging your cooler into your car’s 12V DC receptacle and having your drinks, snacks, and whatever else you might want to squeeze in your cooler nicely chilled by the time you reach your destination? That’s exactly what the Igloo Iceless Cooler brings to the table, thanks to a thermoelectric design that cools your goods directly from the cigarette lighter in your car, just like your fridge at home. As the name suggests, this cooler can be used ice-free, meaning the storage capacity can be upped to as much as 34 cans. 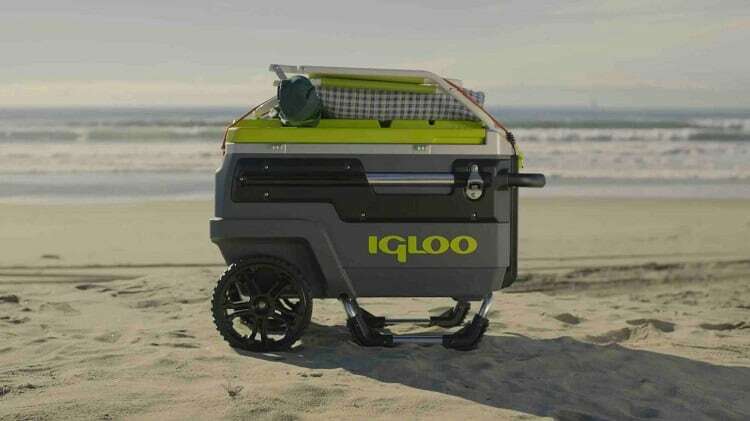 The Igloo Iceless also cools its contents down to 36F below the ambient temperature and comes with an 8-foot power lead that allows you to shift your cooler wherever is most convenient or to make the best use of the shade. The only notable downsides to this cooler are that it isn’t quite as robust as other models like the YETI Tundra (above), takes up to three hours to chill fully, and doesn’t have the thick insulation that allows other models to work so effectively when not plugged in. This cooler is ideal for car campers, letting you plug the cooler into your vehicle’s 12V DC receptacle, kick back, and wait for your refreshments to cool while you go about your business. Safe in the knowledge that your goods aren’t getting warmer by the minute as the ice melts but cooler as the thermoelectric cooling kicks in and builds up to its maximum chilling capacity. There’s convenience and then there’s capital ‘C’ Convenience. When you rock up at your campsite late in the day or are stumbling down to the riverside with all your gear in your backpack, maybe nursing a hangover to boot, the last thing you want is to have a 40 to 50-pound load of liquids weighing you down. With the Coleman Xtreme Wheeled Cooler, you don’t have to—simply load her up, set her down, and roll her to your desired destination. This fuss and frill-free cooler is the very last word in practicality, saving you not only the hassle of using brute strength to carry your refreshments where you want them, but also—thanks to built-in cup holders in the lid—carrying a table. Add to that a huge, 84-can capacity and a very practical drainage gasket and you’ve got a cooler that’s, well, very cool! So what are the downsides to this cooler? Considering the low cost, this cooler’s failings are largely forgivable, but compared to high-end coolers like the YETI tundra it isn’t quite as rugged, has far less cooling capacity (the five-day claim is overstated), is certainly not bear-proof, and is not the type of cooler you’d like to carry terribly far if using the wheels isn’t an option. We only recommend buying a wheeled cooler if you’re sure you’re going to be able to make use of the cooler’s unique selling point: the wheels! Many wheeled models aren’t made without the same convenience as regards portation as non-wheeled models and lugging them over long stretches of trail to your fishing or hunting spot or campsite might cause a lot of hassle and discomfort. For those who like to travel fast and light, coolers don’t come much—if any—better than the Arctic Zone Zipperless Cooler. This one wins our award of the best small camping cooler on account of not only its light weight and manageable size, however, but also a wealth of other very lovable features. First up, this cooler is superbly versatile and convenient. In addition to a walled storage compartment with a removable and adjustable shelf, it comes with a contoured shoulder strap to facilitate carrying, an external pocket for stashing accessories such as cutlery, phones, or keys, and a flip-open design that allows for quick, easy access to your goodies. In terms of chilling capacity it performs none too shabbily, either. While this isn’t the sort of cooler you’d take along on a multi-day trip in the backcountry, for single-day adventures or overnighters its DeepFreeze insulation, radiant heat barrier, and triple-layer Cold Blockbase all ensure you’re goodies will be kept cold for the duration. Compared to the hard-walled coolers in our review, the Arctic Zone Zipperless Cooler obviously lacks a lot of trail-ready toughness and long-term insulating capacity, but for solo, one-night trips it’s just about ideal and is truly hard to beat in terms of value for money. If mobility is a big issue, this cooler is a winner all day long thanks to its robust carry handles and incredibly user-friendly “Backsaver” shoulder strap. That said, before buying, be sure to consider whether you’ll need the added ruggedness and insulation of a hard-case model. You can sit on it! Beer costs enough without having to pay a lot of extra $ just to keep it cool when out on your camping adventures, right? But how is that coolness achieved without breaking (or robbing!) the bank when almost every efficient and effective model of camping cooler on the market costs a small fortune? Enter the Coleman Xtreme Series Portable Cooler. This neat, tidy, hugely practical little cooler does pretty much everything you could ask a cooler to do and, most impressively, does it all at a fraction of the price of some of its closest competitors performance-wise. Already sold? If not, the rest of the specs might just do the trick. The most notable of this cooler’s winning specs and features, for our money, is storage potential. With a capacity of (up to) 100 cans, this isn’t so much a camping cooler as a portable fridge-freezer. As such, for longer trips or adventures with all the family, this one’s just about ideal, and in terms of per-dollar-storage, you’ll be hard pressed to find a better option even by seriously downgrading your expectations in terms of performance. With regard to performance, however, the Coleman Xtreme Series Portable Cooler doesn’t quite live up to the billing of “5-day cooler” stipulated by the manufacturers. In reality, the chill duration is more in the region of 2-3 days if you pack carefully. Nevertheless, a 2/3-day chill for around the same price as a 24-pack of budget beer isn’t bad, right? If considering this option, bear in mind that it will require two carriers when fully loaded—unless, that is, you happen to be built like your average heavyweight wrestler and like to earn your goodies with a bit of a workout before enjoying them. The makeup of a great camping cooler is far more complicated than many first-time prospective buyers may expect. Camping coolers come in a wide variety of sizes. It’s worth noting that the bigger the size of cooler you buy, the harder it is going to be to carry it. While your cooler may seem perfectly portable when empty, once you’ve filled it up with ice and all your goodies you might be looking at a 50-pound burden that will be fairly unwieldy if carrying it long distances. One other consideration with regard to size is the external dimensions of your cooler. Is this cooler going to fit in my raft/boat/tent porch? Am I likely to be camping in any national parks where the use of bear boxes is compulsory? And, if so, will this cooler fit inside the boxes at the national park I’m heading to? Is this cooler going to take up too much space in my vehicle? Insulation is to your camping cooler what the engine is to your car: kinda crucial if you’re expecting it to do what you need it to do. One of the most important factors to consider when choosing a cooler is how long you need to keep your goods chilled. Most budget models are capable of keeping your goodies cold for at least a day if well packed and stored correctly, and some top-of-the-range models can keep their contents cool for as long as ten days with some very careful storage. The longer your trip, the better the insulation you will require. The better the insulation on the cooler, the more $ you’re going to have to part with to get your hands on it. High-end insulation is not only advisable for those headed on longer trips, however, but also on trips where temperatures are particularly high or on hunting and fishing outings when you plan on using the cooler to store your kills. Naturally, the body temperature of the fish or game you’ll be storing will be much higher than the interior of the cooler and so will quickly melt ice in more basic models. Finally, if you plan on carrying frozen or refrigerated foodstuffs on your trip, most budget models of cooler won’t keep either frozen or fresh terribly long. The biggest downside to high-end outdoor coolers is, of course, the cost, but one potentially mitigating factor to this initial outlay is the fact that the superior insulation in such models could save you a small fortune on ice: because better insulation keeps things cooler for longer, you won’t need to replenish your reserves of the frozen stuff quite so often. If you’re car camping or pitching your tent not too far from the roadside, then portability isn’t a big issue when buying your cooler. If, however, you envision a longish trek or plan on taking your cooler on a few trips down the river, fishing, hunting, or any other adventures far from the car, then the size, weight, and the ease with which your cooler can be carried are all-important. In short, there’s a direct trade-off between storage capacity and insulation and portability. Smaller coolers may be able to hold less, but they are far easier to schlep from A to B; and, heavily insulated coolers might keep your goods cool for longer, but in most cases will weigh at least a few pounds more than less well-insulated models with a similar capacity. As such, striking a balance between your storage needs and portability is often the key to getting your hands on the cooler that’s right for you. If you require the storage offered by a model in the 70-quart range, we’d highly recommend you look for a wheeled model with two sets of handles—unless, that is, you happen to have a personal Sherpa or friendly weightlifter handy who’s going to do the carrying for you! That said, when choosing a wheeled model of cooler, be sure to bear in mind the type of terrain you’ll be hauling it over—while those wheels will be worth their weight in gold on flat, even surfaces, on rougher trails they’ll be all but useless. The seal or latch on your cooler might seem of secondary importance to other features, but only if you’ve never previously wrangled with an ill-fitting seal or latch or one that has refused to close fully, thereby leaving your ice to melt and your goods to slowly warm up inside. Most cheaper models of cooler rely on an internal seal that works much in the same way as the door of your fridge, sealing shut by way of suction and, in some cases, a small latch that clicks into place when closing. While this design is okay if you envision lazing around the campsite with your cooler safely stationed on the floor or in your vehicle, if you’re taking it with you on any hunting, hiking, or river adventures then external, clip-over latches are a huge plus. These external latches might diminish ease of access ever so slightly, but if you’re likely to be exposing your cooler to a bit of rough and tumble they ensure that all your goodies stay where you want them to stay—inside the cooler! A number of factors contribute to a cooler’s ease of use. In addition to the portation, size, and weight considerations mentioned above, it’s a good idea to take a good look at how it measures up in terms of care, maintenance and—in particular—drainage before committing to a purchase. Other less crucial but nonetheless significant factors to consider are the compartmentalization of the storage and any handy add-ons that simplify finding your food when need be, such as shelves and partitions or dividers. A simple but effective drainage system is the key to making a cooler user-friendly. Not only does this simplify cleaning, but also helps to keep your cooler in good nick in the long term and facilitates emptying out all of that melted ice you’ve packed in to aid cooling. Some budget models of cooler don’t feature any built-in drainage system. While this isn’t a dealbreaker in and of itself, it does mean that you’ll have to entirely empty the cooler’s contents before draining out excess meltwater. The drainage setups that let you get around this small but irksome logistical nuisance generally use a screw-in gasket and drain plug or a simple faucet. Ideally, these should be located low enough to allow you to drain water without losing ice or putting in too much manual effort tipping the cooler. A few features that can simplify the drainage process are lanyards attached to the gasket plug and garden hose compatibility. The former will ensure you don’t lose your plug (also easily done, particularly if the cooler’s contents happened to be beer!) and the latter empty meltwater without having to shift the cooler or soaking your vehicle, gear, or tent. A quick Google search will reveal that there are dozens upon dozens of brands out there all selling the self-proclaimed “best camping coolers” on the market. So how do we narrow down our search to ensure we’re comparing the best products when weighing up a purchase? Big brands YETI and Coleman have had something of a monopoly in the camping cooler market for quite some time. And with good reason—both brands produce very high-quality coolers that have served their users well for many years. Coleman offer low-cost, lower-insulation coolers that are good for shorter trips, whereas YETI offer top-of-the-range, very durable, robust, high-performing, portable fridge-freezers that are capable of keeping your drinks and foodstuffs cool for the duration of multi-day trips. Which is best for you, therefore, will largely come down to your budget and expectations with regard to performance. This will ultimately depend, of course, on how much you intend on putting in it. The more people there are in your camping group and the longer the duration of your trip, the bigger the cooler you’ll need. The best tip we can give buyers in this regard is to opt for a slightly bigger cooler than you think you’ll need rather than a slightly smaller one—your cooler will chill fewer items just as well as it will more (just be sure to pack air pockets with ice) but won’t keep anything cool if you can’t close the lid because you have too much stuff! Bear in mind, also, that most models of cooler provide a can-carrying capacity in the product description. While useful, if you intend on carrying other items such as bottles and larger foodstuffs you’ll have to pay closer attention to the internal dimensions of the cooler to make sure they’ll fit inside. HOW SHOULD I PACK A COOLER FOR CAMPING? A few handy tips can help you make the most of your cooler both in terms of space and performance. Prep your food at home to save carrying condiment bottles and things you’ll discard at camp (shells, peels, stalks, ends, cans, packaging). Store your food in leak-proof containers so you can reseal after use and keep things clean and tidy. 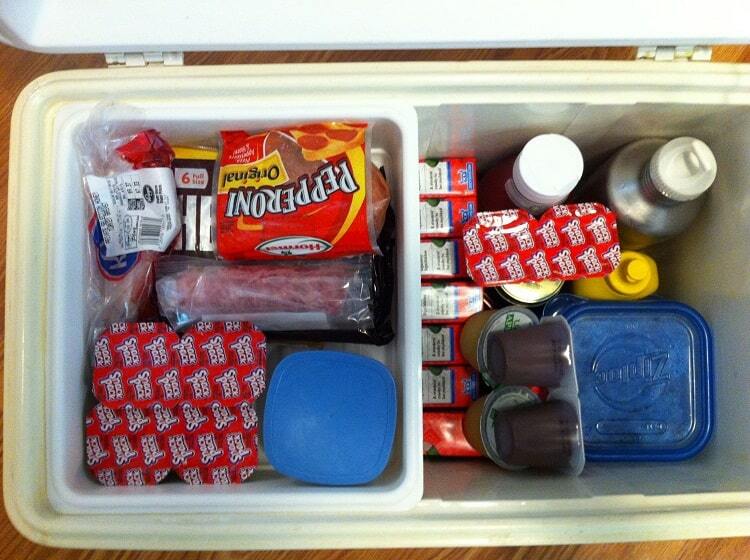 Freeze freezables and refrigerate everything else to aid cooling, particularly if headed on a multi-day trip. Wait until the last minute before transferring your cooler and its contents to the car in order to minimize its exposure to ambient air temps. Pack from the bottom up, starting with a layer of ice and the food items you’ll be using last on your trip and finishing with those items you’ll be using first. HOW TO KEEP FOOD COLD IN COOLER WHEN CAMPING? In short, air is the enemy. Try to fill all unused space inside your box with ice. Start off with a layer on the bottom of the cooler, fill any gaps between items as you pack them in, and then add a further layer of ice on top of the goods before closing the lid. Naturally, your food and drinks will stay cold for longer if frozen or refrigerated before placing them in the cooler. HOW TO KEEP YOUR COOLER COLD WHILE CAMPING? WHAT TO PUT IN A CAMPING COOLER? 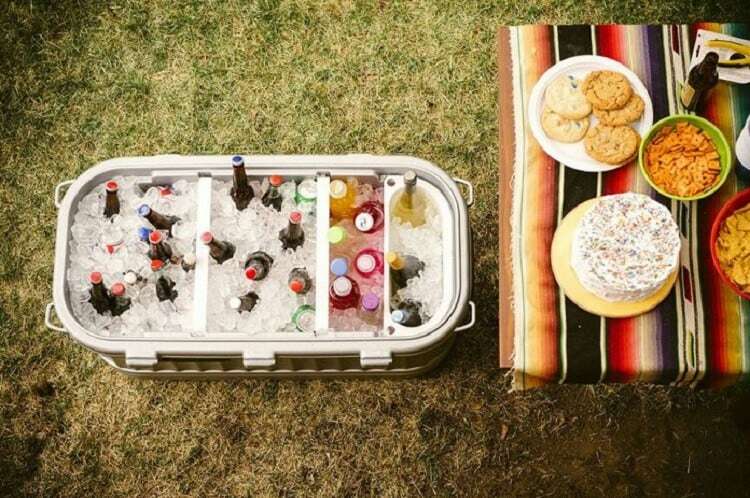 Camping coolers can be used for storing and cooling just about anything you wish to put in them—not just beer! The main point to note here is that it’s vital to store different items in leak-proof containers and to keep raw meat and fish separate from drinks and other foods. HOW TO USE DRY ICE IN A COOLER FOR CAMPING? You might not have heard of it, but dry ice is the future of long-term food storage for backcountry adventurers. In short, dry ice is frozen carbon dioxide. Keeping you comestibles cool, fresh, edible, and drinkable in the backcountry requires a bit of effort. Most of us who’ve spent a week chewing on squished granola bars or drinking lukewarm beer, however, will all agree that it’s an effort well worth making. But that effort doesn’t merely entail carrying a cooler full of ice with you on your trips. It also means using a great deal of diligence when it comes down to choosing the best outdoors cooler for your specific type of adventure and avoiding the less worthy models currently flooding the market. The good news is that by following the above advice and selecting any of the coolers featured in our review, you’ll be one step ahead of the game and well on your way to many a future camping trip with all your must-have goodies safely stowed, optimally chilled, and at hand whenever you need them.